Minuteman ball handle tool set is 22" high making it the right size for most wood stoves or smaller fireplaces. Set includes poker, shovel, broom, rake and stand. Powder coated black only. Cast Iron base and ball handles. Ships KD. 5-pc fire tool set for stoves is a contemporary styled set with poker, shovel, brush, and tongs. Set measures approx 25" tall. Made by SCAN in Denmark. Color: Black with chromed handles. Closeout. 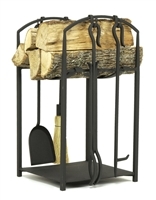 Minuteman wrought iron tool set is 38 1/2"" high making it the right size for most fireplaces. Set includes poker, shovel, broom, rake and stand. Powder coated black. Wrought iron shepherd's hook style is hammered in so there are no screw-on handles to twist loose.